Niksan has pioneered the concept of Lingerie Trade and Fashion shows way Back in the year 2000.With the 1st ever trade fair in this subcontinent in the year 2000, the exhibitions have come a along way. BODYWEAR EXHITBITIONS has been increasing the participants with each passing show, while retaining 75% of its clients & participants in each of the previous 19 shows. With such high retention, the expo has proved in no uncertain terms , the high level of professionalism and satisfaction ; it’s participants have derived from this platform. All of these which have made THE BODYWEAR EXBHTION AS THE LEADING INTIMATE WEAR TRADE SHOW IN THE SUBCONTINENT. One source that has undeniably led to my growth as a sourcing expert in lingerie is the Bodywear Exhibitions and I am looking forward for the 20th Edition. You need to fill in the Participation form along with 40% remittance or RTGS to Niksan Enterprise. 20th Edition of Bodywear Exhibition will consist of wellstructured Zones, for more details please do refer to our Floor Plan. 5- 15% Extra for Corner , Semi & Premium booths. The dates 9th & 10th March are just the right period of having the exhibition at Gujrat, which is the epicentre of the West of India. Gujarat having the 3rd Highest GDP Ratio in India after Maharashtra & Tamil Nadu at 14.96 lakh core , and a PER CAPITAL INCOME OF 1.70 LAKH make Gujrat one of the largest ECONOMY IN INDIA. Gujarat It is the sixth largest Indian state by area and the ninth largest state by population. It is bordered by Rajasthan to the northeast, Daman and Diu to the south, Dadra and Nagar Haveli and Maharashtra to the southeast, Madhya Pradesh to the east. This makes Ahmedabad Boarded by more than 4 Major States & 2 Union Territory , and easily connected to over 90 cities across India. One Indian academic, Sedha Menon, compares the state–which has developed infrastructure more quickly than its domestic rivals–with Singapore and parts of Malaysia. Per-capita incomes in Gujarat are more than twice the national average. India’s seventh-largest city has a population of roughly 5.7 million and is expected, according to the U.N., to grow to over 7.6 million by 2025. Ahmedabad is also the only Indian City to make it to the Forbes list of the Fastest Growing City of the Decade. With the rise in the literacy rate , the brand awareness of the locals and the super ease of doing Business in the State & City , & the ever growing Intimate Wear Industry of GUJARAT, Ahmedabad was a No-braniner to Host the Prestigious 20th Edition of BODYWEAR EXHIBITION. 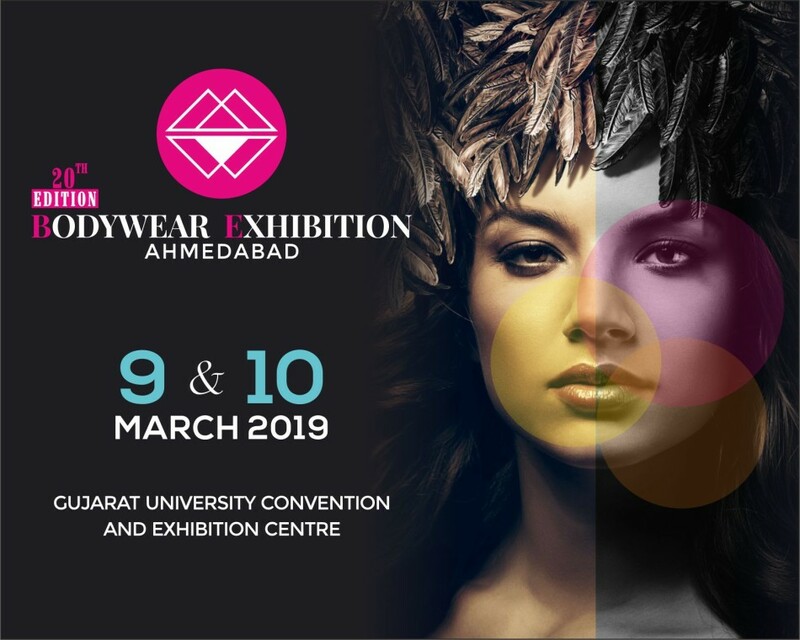 Bodywear Exhibition Ahmedabad will include the best of best intimate apparel brands & the best suppliers of Intimate wear Accessories & Traders from all over India. ACCESSORIES MANUFACTURERS & TRADERS DEALING IN. Free Accommodation for Premier Participants and Trade Buyers. Extensive use of Digital marketing tools which includes hi-pitched campaign on FB,Instagram, Twitter etc.